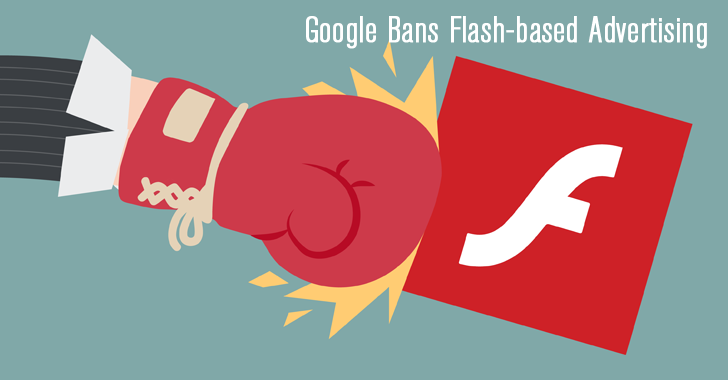 Google had also joined the path of Apple, Facebook, and Youtube to kill the "Adobe Flash Player" by announcing that the company is banning Flash banner support from its Adwords Advertising platform. "To enhance the browsing experience for more people on more devices, the Google Display Network and DoubleClick Digital Marketing are now going 100% HTML5" Google says. It's been two decades since Adobe Flash has ruled the Web Space Animation Arena, which was the de facto standard for playing the online videos. Flash Player had been famous for Zero-day exploits which are a potential threat to online users. Even Adobe tried to maintain equilibrium by releasing a countless number of patches frequently (that got hiked), for instant reported vulnerabilities, but this had annoyed both customers and companies. The endless troubleshooting of the Flash Player plugins never resolved the vulnerabilities. To put a full stop on this issue... many major tech companies like Apple, Facebook, Youtube, Google Chrome, Firefox had been magnetized towards the new substitutor - HTML 5. Google Chrome has also begun blocking auto-playing Flash ads by default. In January this year, YouTube moved away from Flash for delivering videos. Firefox also blocked the Flash plugin entirely. By ending up Flash, all the above companies found a silver bullet to the security issues that have plagued Adobe Flash for years, as well as eliminated a third party dependency. HTML 5 has gained a Word of Mouth Popularity by many developers and also have many advantages like to play the video smoothly, in fact, in a better way. So, Google also officially declared that it would not support Flash ads in Doubleclick Digital Marketing from July 30, 2016. Moreover, from January 2, 2017, the company will discontinue the support for Google Display Network as a part of complete Flash Wipe Out. However, as a Result of this awful reputation, Flash Player would be rebranded as “Animate CC” with some additional features like the direct conversion of Flash Files to HTML5 Canvas files. Adobe Animate CC – mostly looks like an update to the Flash Professional software – supports Adobe Flash (SWF) and AIR formats 'as first-class citizens,' along with other animation and video formats, including HTML5 canvas, 4K and WebGL output.